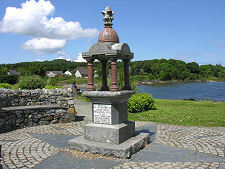 Skye's second largest settlement, Broadford, lies in the shadow of the Red Cuillin mountains and spreads itself along the southern side of Broadford Bay. Views over the bay extend out to the Isle of Pabay and more distantly to the Applecross mountains on the mainland. 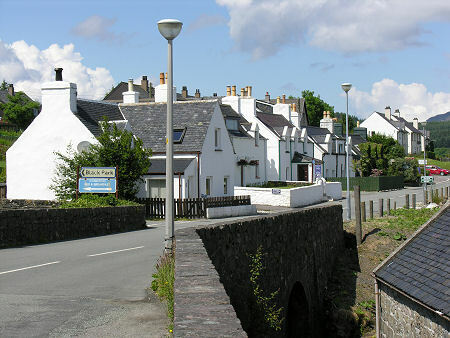 Broadford's origins date back to a cattle market held here from the late 1700s, and in 1812 the road from Kyleakin to Portree was built by Thomas Telford through the village. It grew rapidly with the settlement here of Napoleonic veterans after 1815, and at about the same time it had a brief-lived distillery. 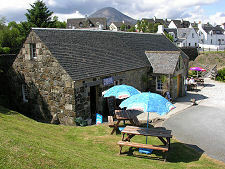 Today's village tends to be treated as a service centre for southern Skye. 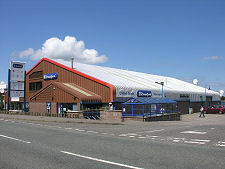 It is now the first significant settlement you come to after crossing the Skye Bridge, and its daily life tends to revolve around the large car park by the main petrol station and the Tourist Information Centre. Nearby is a large Co-Op supermarket; and a bank with a cash machine. 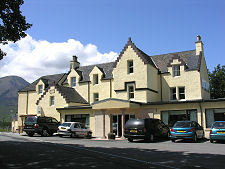 Broadford also offers a range of accommodation, from the large Broadford and Dunollie Hotels, through to smaller hotels, B&Bs, and hostels. 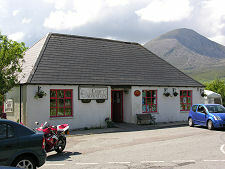 Broadford offers the visitor rather more than just the basics of life. 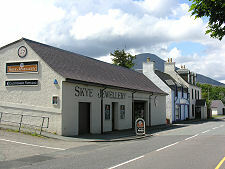 Skye Jewellery, with a large showroom towards the eastern end of the village (and with its own car parking behind), offers a superb range of jewellery made on the premises. And until its sad closure at the end of the 2015 season, the Skye Serpentarium gave a fascinating opportunity to get close to creatures that some of us would rather avoid. 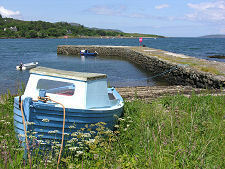 Many visitors pass through Broadford without realising it has a harbour. In fact, it arguably has two. 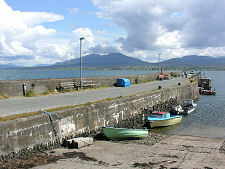 One pier, the more frequently used these days, can be found at the end of a narrow road on the western side of Broadford Bay: nearby the pier are moorings for visiting yachts. 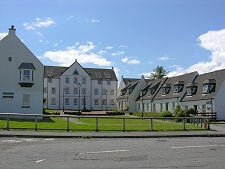 This part of Broadford, more properly known as Corry, is also home to a hospital and to the Broadford Youth Hostel. 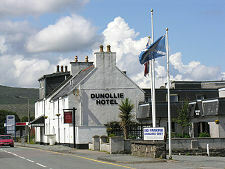 The second harbour, known as "The Old Pier", lies behind the Dunollie Hotel, and is accessed down a road opposite Skye Jewellery. Overlooking the Old Harbour are the remains of lime kilns. Even without the steamers that used to call here en route to Portree this is an attractive location and a world away from the usual image of Broadford. 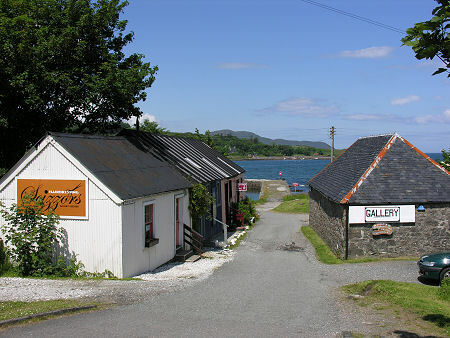 And as you return from the harbour to the main road you pass a series of brightly painted little businesses and a book shop, and the Broadford Gallery. This part of the village is well worth exploring. Two miles north east of Broadford, at Ashaig, is Broadford Airfield. Until the late 1980s this offered scheduled flights, and campaigners hope it may one day do so again. Everywhere ought to have some historical claim to fame, and Broadford is no exception. During the flight of Bonnie Prince Charlie in 1746, he was helped by a Captain John MacKinnon. In return, the Prince gave MacKinnon the recipe of his personal liqueur. After being made by the MacKinnons on Skye for their personal consumption for over a century, the drink went public in the Broadford Inn (now the Broadford Hotel) in the 1870s, and the name Drambuie was registered as a trademark in 1893. Commercial production started in Edinburgh in 1909 and the company producing it achieved worldwide success under the chairmanship of Georgina MacKinnon. The name, incidentally, comes either from an dram buidhe meaning "the yellow drink" or an dram buidheach meaning "the drink that satisfies". Which translation you prefer depends on whether you are swayed more by the very literal way in which things were very commonly named after their colours in Gaelic, or by the desire to market a brand!